Are you looking for breathtaking vintage wedding gowns? Look no further Mill Crest Vintage who has one of the largest collections of vintage fashions for all of your wedding needs. Their collection of striking vintage wedding gowns is to die for. We also have to mention that their vintage evening dresses are an excellent choice for your rehearsal dinner dress. So many cute options. 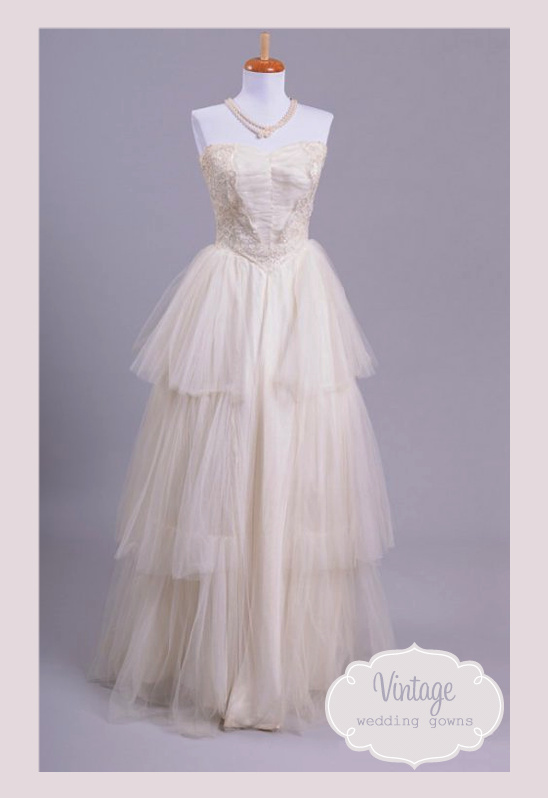 We are in love with the 1950's "Peggy Sue Got Married" Tiered Wedding Gown shown above. Made of soft to the touch tulle over a silk satin lining, the strapless bodice is boned and features a sweetheart neckline with lovely ruching running down the center to create almost a heart shaped design. This would look amazing on you! For the entire vintage wedding collection be sure to visit Mill Crest Vintage. They also have a boutique located in, Lambertville, NJ which can easily be reached from New York City and Philadelphia.